Michelle Myers (Hawkins), “Shel” is an artist and an Elementary School Art Teacher originally from Orlando, FL. She received a BA in Studio Art with a minor in Art History from Florida State University. Growing up she was surrounded by her dad’s passion for drawing, painting and chalk art. She has also developed that same passion. 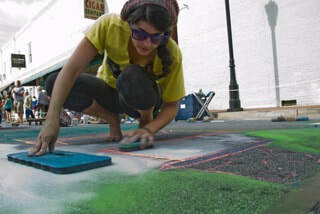 Michelle has been creating chalk art “Street paintings” since 2005. She started out chalking with her dad “Hawk” and now does so alongside him. Nature has always been a fascination to her because of the free and organic structure it possesses. Creating chalk art is a different kind of art to her. It is a chance to go big, think outside the box and overcome the obstacles Mother Nature can throw at you. Just being able to make art come alive on the streets no matter what the subject is; that is all that matters. Michelle is part of the Florida Chalk Art Association and has been awarded the designation of Semplice.